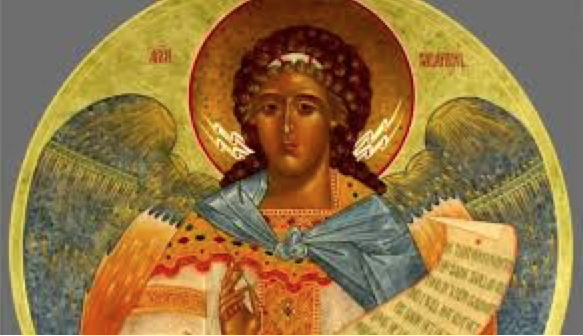 My name, Uriel, means “Light of God, “ and I have loved humans for millennia. I could offer you many insights on human evolution, since I have witnessed your development over thousands of years. I led the great Patriarch, Abraham; I delivered from on high the message to Noah predicting the great flood. I have interceded on humanity’s behalf many times, and have now the privilege of delivering humans into the Aquarian Age. I serve as planetary midwife to all taking birth in this New Age. Today, I speak to you of beauty. At the closing of any great Age, the human psyche is presented with many images. Today, they are captured by the media and flashed into your consciousness with strangely little regard. The process of an Age dying holds numerous similarities to the process of a human death. When the eyes close and the death process begins, as the blood drains from the frontal region of the brain, images of demons and monsters appear before the dying being. As the process continues, these dreadful images fade and are replaced by the arising of beautiful beatific images of all types and traditions. Beautiful beings, angels, and guides, lead the dying through various stages into a great field of divine light. At this point, one feels suspended in an ocean of love so brilliant as to be utterly unimaginable. The hellish images dissolved, one opens to a vast spaciousness of love and pure consciousness. This process takes only a few minutes, and the journey into the in-between state is launched. In the case of a dying Age, the hellish images are imprinted in the fertile field of consciousness over decades. You are now in the first stages of a dying Age. Hellish images confront your hearts and minds in a dizzying, and seemingly infinite array. You have not yet enjoyed the bliss of the beautiful images that will eventually arise to guide you into this New Age. While you are not in control of the process, you are certainly instrumental, or can be, in both the timing and the arrival point where the hellish images fall away from the collective psyche. You do have input into the process, input that is largely determined by the images you entertain in your consciousness. As an Age closes, visionary revelations increase for those able to apprehend them. Beatific imprints are pulsed into human consciousness to interrupt the demonic apparitions they will ultimately replace. Thus, you must rest in the comforting support of beauty. Surround yourselves with the images that will part the veil and carry you through the maelstrom. You have not been forgotten, nor has the Divine abandoned Earth. You are in the process of rediscovering the many faces of the Divine, and you can facilitate the revelatory process by resting your senses in the many forms of beauty that are encoded with the Presence of the Divine. Feast your eyes on beautiful sights, your ears on beautiful sounds, your smell, taste, and touch with beautiful stimuli. In like manner, do not receive the many hellish images as if they are real. Treat them as impressions from a nightmare that, when awakened, are released. Look and listen for beauty, breathe it into the core of your being, and know you have many friends among the angelic realm who will guide you into deeper and broader experiences of beauty – if you only ask to be so led. We will greet you in beauty, grace you in beauty, and allow you to rest in beauty. Reach out with the hands of your hearts and accept the gifts we offer you. Above all, walk in beauty and offer beauty to all the sentient beings of Earth. This entry was posted in Authors, Quotes on consciousness and tagged archangel uriel, love light, new age, responsibility. Bookmark the permalink.